It turns out that the National Museum of the American Indian isn't the last museum to be located on the National Mall in Washington, D.C. The Smithsonian Institution announced on Monday that the National Museum of African-American History and Culture also will be built there. 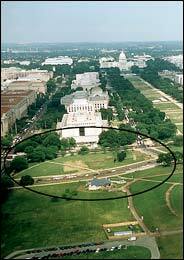 The African-American museum will be located at the southwest corner of the Mall, next to the Washington Monument. NMAI is located on the northeast corner, next to the U.S. Capitol. The African-American museum will be about the same size as NMAI, The New York Times reported. Estimates for the facility run from $300 million to $500 million, as much as twice the cost of NMAI. NMAI opened in September 2004 during a weeklong ceremony attended by upwards of 20,000 Native people. The museum's newest exhibit, "Listening to Our Ancestors: The Art of Native Life along the North Pacific Coast," featuring the art of 11 Native communities in Washington, British Columbia and Alaska, opens February 3.